Alphabet Glue: The Summer Science Special. Summer, it seems to me, is a very good time for thinking about science. Indeed, if it is a slow summer afternoon at our house and the small person needs a little something for entertainment, coming up with something involving science is usually enough to save us all from the effects of restlessness and very often, even that most dreaded of vacation-time utterances: "I'm bored." But here's the trick: this requires having a science experiment tripping around inside my head, a list of the stuff we need to do it, and then of course, it is always nice to have a book or three to tie in with the experiment. You know, so that it takes more than just a few minutes when what we really need is an hour's worth of busy. So, I've put together this special issue of Alphabet Glue, full of all of the things that I was wishing I had when summer vacation arrived and I wasn't quite as ready for it as I thought. A collection of simple but satisfying science experiments and projects, The Summer Science Special is kid science at its best. Each of the four activities in this mini-issue comes neatly packed up alongside a short review of a favorite book that makes a particularly good companion read for the hands-on project, as well as a leveled booklist organized to fit the theme of the experiment. Cloud mixing, rocket launching, the making and painting of bird's eggs; there is plenty of fun to be had here, and the four brand new booklists mean that you can be sure to have plenty of excellent reads to peruse while doing it. Summer is in full swing, and I vote that we celebrate this fact with a bit of kitchen table science. The Summer Science Special is available as a PDF download for $2.50 USD. Volume Seven, the most recent regular issue of Alphabet Glue, is available as a PDF download for $4 USD. Volumes One through Six are also still available for download for $4 USD. Click the buttons below to purchase one or more issues of the magazine. You can also purchase all seven issues of Alphabet Glue in one handy PDF file for the discounted price of $26.00 USD. That's over 240 pages of printables, activities, booklists and projects! Or, if you are just interested in the newer issues, you can download a bundle of the three most recent volumes, Five through Seven for a discounted price of 11.00. Whichever Glue you choose, I hope that you'll enjoy each of the projects and activities inside. 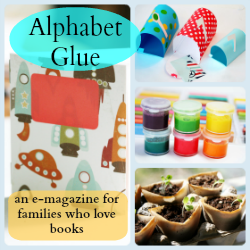 To learn more the other issues of Alphabet Glue, you can visit the Alphabet Glue page here.